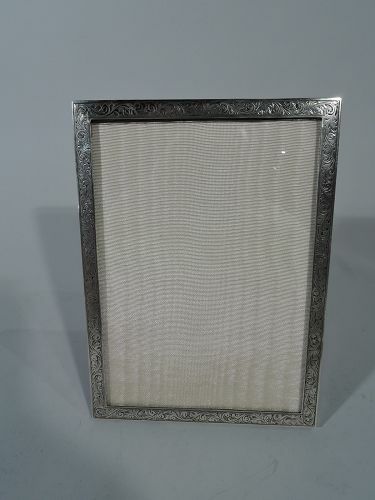 Pretty old-fashioned sterling silver picture frame. Made by Charles S. Green & Co., Ltd in Birmingham in 1953. Rectangular window bordered by engraved scrollwork. With glass, silk lining, and stained-wood back and hinged support for portrait (vertical) display. Hallmarked. Good condition with nice patina. 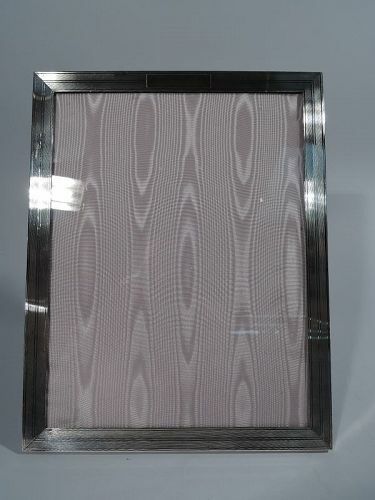 Large Modern sterling silver picture frame. Retailed by JE Caldwell in Philadelphia, ca 1940. Rectangular window. Flat border has engine-turned wrap-around lines and rectangular tablet (vacant). For portrait (vertical) display. With glass, lining, and laminate back and hinged support. Hallmarked Hickok-Matthews (originally Lebkuecher) with retailer’s name and no. 3011NN. Good condition. 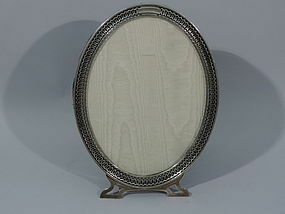 Edwardian sterling silver frame. Made by Gorham in Providence in 1914. Rectangular window and wide flat border engraved with dense and dynamic flowers and scrolls. Scrolled cartouche (vacant). With glass, silk lining, and velvet back and hinged support. For portrait (vertical) picture. Hallmark includes date symbol, letters HBJ, and retailer’s name (T. Kirkpatrick & Co.). Very good definition and crisp corners. 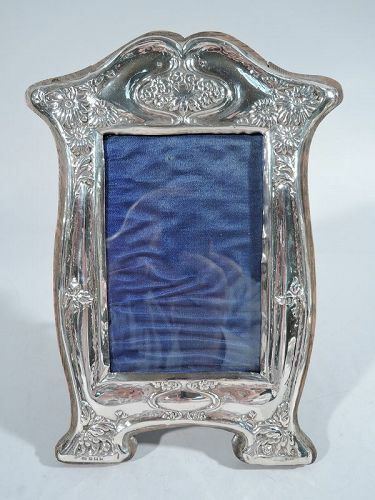 Italian hand-made sterling silver filigree picture frame. Rectangular window bordered by scrolled filigree with applied flowers and leaves. With glass, silk lining, and velvet back and hinged support. 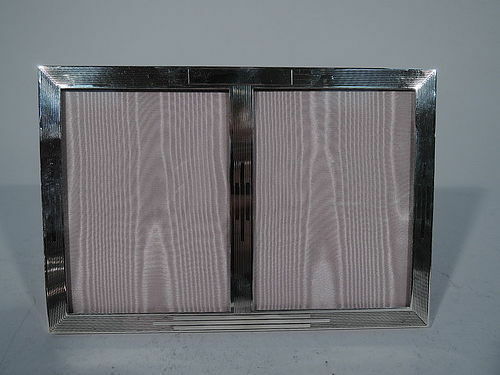 For portrait (vertical) or landscape (horizontal) display. Hallmarked (1968 to present) with name Tadiello and maker’s mark 1497 MI. Filigree in excellent condition. 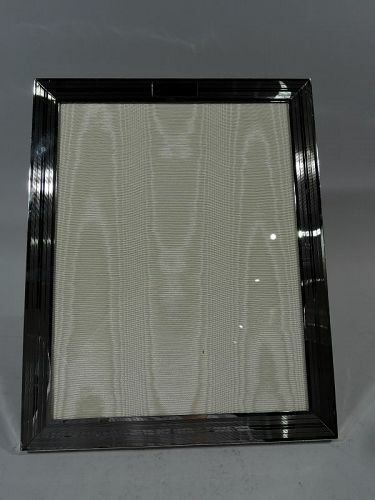 Very large sterling silver frame. Made by International in Meriden, Conn., ca 1920. 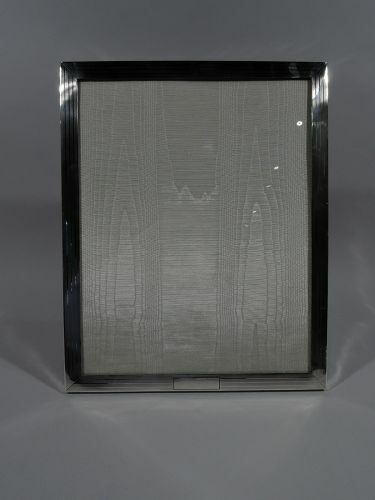 Rectangular with engraved wrap-around lines and rectangular tablet (vacant). With glass, silk lining, and laminate back and hinged support. There’s enough room for the family reunion group shot. Hallmark includes no. NP11/1. Nice condition. 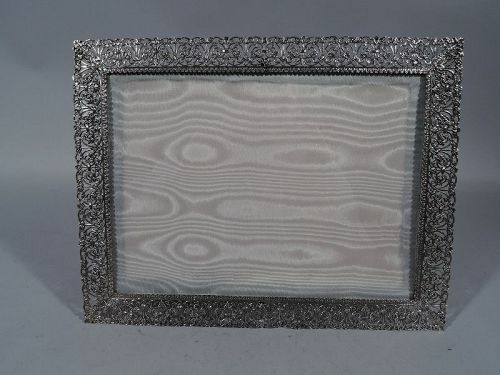 Sterling silver picture frame. Made by Fradley in New York, C 1910. 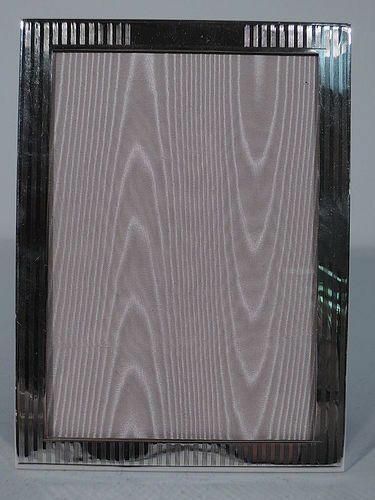 Rectangular with groups of fine engraved vertical lines. Rectangular cartouche (vacant). With glass, silk lining, and velvet back and hinged support. Hallmark includes no. 2069T. Nice condition and patina. 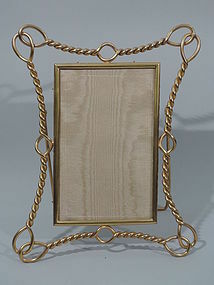 Sterling silver double picture frame. Made by Graff, Washbourne & Dunn in New York, ca 1950, for Cartier, also in New York. Two rectangular windows bordered by engraved linear ornament. Rectangular cartouche vacant. A snazzy showcase for a special twosome. With glass, silk lining, and velvet back and hinged support. Maker's and retailer's marks and no. 23. Excellent condition with crisp corners and nice patina. 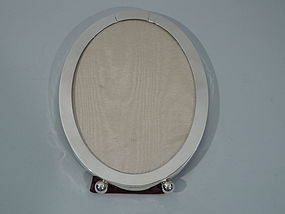 Sterling silver oval picture frame. Made by Gorham in Providence. Oval window with flat border, raised tablet (vacant), and 2 ball supports. With glass, silk lining, and velvet back and hinged support. Hallmark includes no. B3365. Very good condition. 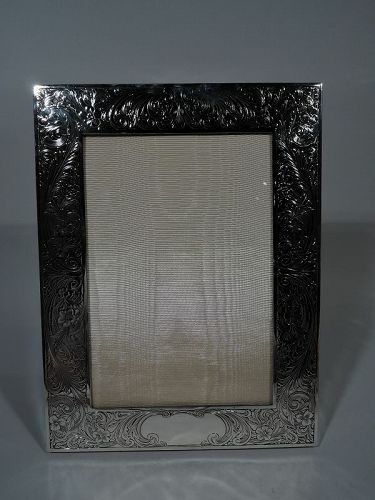 Sterling silver picture frame. Made by Watson in Attleboro, ca. 1925. Oval with pierced circular border and open bracket supports. Tubular cartouche (vacant) at top. For vertical display. With glass, silk lining, and velvet back and hinged support. Hallmark includes no. 2993. Excellent condition.